In May 2017, this blog published a post entitled ‘Knife crime in Waltham Forest: a nasty little scandal (1)’, which, somewhat unexpectedly, attracted a big readership. What follows provides an update, focusing both on knife crime specifically, and the broader (though intimately related) issue of gangs and gang violence. First off, and very regrettably, it is worth underlining that the knife crime problem in the borough is actually worse now than it was at the time of the original post. Indeed, in FY 2017-18, the number of offences was 27.34 per cent up on the previous year, a rise that was significantly greater than that in the Metropolitan Police Service area as a whole (21.17), and compares very badly to the figures for neighbouring boroughs Newham (10.75 per cent) and Hackney (3.77 per cent). Meanwhile, knife crime Sanction Detection Rates – measuring prosecutions etc. – declined in Waltham Forest from 17.45 per cent to 15.75 per cent, meaning that in each year more than four-fifths of perpetrators escaped justice. The problem, in other words, far from dissipating, is now more pressing than ever. What about the authorities’ response? In 2017, that seemed to be patently flawed. Has it improved? The organisation best placed to lead campaigning against local knife crime is the Waltham Forest Safer Neighbourhoods Board (WFSNB), since it brings together not only the statutory partners but also representatives from the community; and in addition has access to Mayor’s Office for Policing and Crime (MOPAC) funding. So what has it been up to? The WFSNB aims to meet four times a year, and while it held only a single meetings in FY 2016-17, the following year it met its target. Moreover, there were several fruitful discussions, in particular with the Borough Commander or his senior colleagues. But on the other side of the coin, attendances were often poor – at four of the five meetings, less than half of the members turned up – while in FY 2017-18 much time was expended on purely internal matters such as membership and terms of reference, with those who sought more openness, and a broader range of participants, ranged against an entrenched leadership intent on maintaining tight control. To make matters worse, the WFSNB’s handling of MOPAC funding was also revealed to be unsatisfactory. The WFSNB typically used such monies to help third parties run mutually agreed projects, for example diversionary work to discourage gang membership. Unfortunately, however, as a previous post (referenced below) shows, the WFSNB consistently failed to submit interim and final reports on these various projects in line with MOPAC deadlines, leading the latter to threaten an embargo on further funding. ‘Outcome 1 was achieved – 19 subjects agreed to work with the project. Regrettably, there appears to be no evidence that (2) the risk of reoffending was reduced, or that (3) subjects were being successfully signposted into Education, Training or Work’. And in another case, the WFSNB chair told MOPAC that though the project delivery partner was upbeat, the basis for its claims was ‘thin on detail, and thin on evidence of achievement’, adding: ‘I don’t think the SNB did a good job with this project of pinning down detailed monitoring…’. In short, despite LBWF assistance in terms of officer time and know how, the WFSNB seems to have found routine administration a struggle, with due diligence, oversight, and evaluation inevitably then found wanting. Turning to LBWF, its major interventions in the past year are two reports, one an internally authored, eight page, ‘Knife Crime: Waltham Forest Partnership Strategy’, the other a more substantive piece of work, costing £50,000, procured from South Bank University’s Risk, Resilience and Expert Decision-making research group, and entitled From Postcodes to Profit. 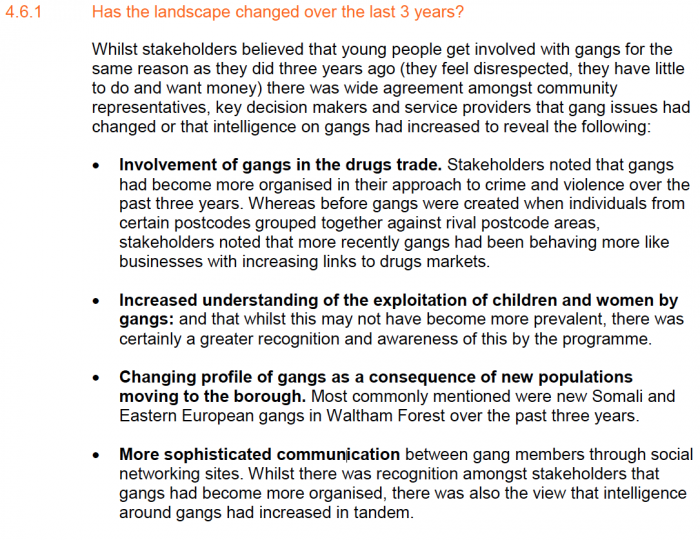 How gangs have changed in Waltham Forest. The ‘Knife Crime: Waltham Forest Partnership Strategy’ document rehearses some data on the prevalence and causes of knife crime (largely relating to either London or England and Wales); looks briefly at ‘what works’ in terms of a public health approach to the problem; and then ends with a two page action plan, expressed as a series of rather vague pledges (‘The Council (Early Help) will lead consideration of commissioning population-level prevention programmes for young people (e.g. Lifeskills)’). Revealingly, there is no discussion at all of budgets, and only very general consideration of outputs measures and targets. The most generous conclusion is that this is still a work in progress. Our dialogue with professionals, young people involved with gangs and former gang members has been dominated by the rise of one gang, the Mali Boys. They have led the current change…. The focus of the new operating model is expanding territory to secure new drugs markets. In response to the saturation of the London drugs markets, gangs are moving outside to develop operations in other towns where there is little competition and they are unknown to local law enforcement agencies’. (b) ‘The second major development is the increasing involvement of women and girls in the activities and identity of gangs’. (c) ‘The third development is the growing role of social media and technology’. None of this is controversial in itself, but on the other hand there are certainly doubts about the exercise as a whole. First, reference has been made to a choreographed launch, and it reasonable to ask whether this was merited. What happened was that on 5 June 2018 the LBWF Cabinet discussed the report in a closed session, and then the next day selected journalists were briefed about its contents. It is unclear why this staged approach was adopted, but the suspicion is that LBWF was trying to evade awkward questioning, particularly about budgets, something that hardly reflects well on either its priorities, or its commitment to transparency. Second, though From Postcodes to Profit has been described as groundbreaking, those with local knowledge and longer memories will wonder if this is wholly true. One such expert told Waltham Forest Matters that he had read the document and ‘learned nothing new’. What’s unarguable is that some of the South Bank team’s insights are far from novel, and have appeared in the literature about Waltham Forest several times before. (a) a study of drug related crime in Waltham Forest in 2006 alleged that ‘the local police have intelligence linking the main gangs in Waltham Forest with drug dealing’; described how ‘intense competition’ over drug markets produced ‘mutual violence and intimidation’; and also reported evidence of professionalisation (‘Many dealers were described as pro-active in trying to increase their customer base – approaching individuals to give out phone numbers, praising the quality of their product and, in some cases, offering enticements and free tasters to new customers’). (b) a detailed assessment of youth violence in South Leytonstone completed during 2010 established that young people saw drug dealing as the heart of the problem; and repeatedly remarked upon the role of women (‘Although the statistical analysis showed only a small proportion of female involvement in violent activity, the issue of “girls and gangs” is subject to increasing focus. A number of stakeholders raised female involvement in violent activity both as perpetrators, facilitators and victims’). Against this background, it is difficult not to conclude, as regards the £50,000 spent on From Postcodes to Profit, that LBWF bought a pup, and for reasons that are as yet unclear, acted in a way that was more to do with spin – the wish to be in the public eye – than anything else. Finally, it’s worth turning to look in a little more detail at the aforementioned GPP, since although this was downgraded in 2013-14 (see, again, the link below), it does still exist, and in theory should be part of the equation. One obvious point of interest is the GPP budget. It must be said that even in the programme’s heyday, transparency about finances was notably lacking. However, piecing together various bits of information suggests that from 2011 to 2013, the GPP was allotted between £1m. and £1.5m. a year, with actual expenditure hovering around the £1m. mark (incidentally, whether underspend was carried over has never been clarified). Currently, LBWF states that the 2018-22 budget is £3m. (which includes a pledge made at the launch of From Postcodes to Profit to add £806,000 to the pot), giving an annual figure of c. £750,000 or about a quarter less than four years ago. Given that, as already described, knife crime in the borough recently increased by a third, while according to the South Bank team local gangs are prospering, such a diminution in itself is rather startling. It is self-evidently pointless spending money unless there is an accurate record of who receives it and what it buys. That is the only way to prevent waste in the present, and also ensure that when future reviews occur, past mistakes can be avoided. Yet scouring the publicly available sources on the GPP reveals plenty of blather, for example airy talk about what fine things are coming in the future, but only a smattering of hard data. One example is illustrative. In 2016-17, the LBWF Community Safety Scrutiny Committee investigated the GPP and produced a short final report. The latter includes just two substantive pieces of numerical evidence – that the GPP had ‘worked with 171 individuals in the first 6 months of the 2016/17 year’, and that ‘there was an 8%-9% reduction in re-offending by people in the Programme on a short-term basis’. There were no series documenting participation year by year; no information about where those ‘working with’ the programme had come from, or the seriousness of their alleged involvement in gangs and criminality; no list of outputs for the programme’s various constituent parts; no budget or expenditure figures; and perhaps, worst of all, not even a rudimentary attempt to establish whether the current approach was either working in its own terms or represented value for money. The overall conclusion that emerges from these paragraphs, therefore, is not a happy one. The post of 2017 ended by observing: ‘All told, it is difficult to think of a more depressing example of fiddling while Rome burns. And of course it is young people who are paying the price for the adult ineptitude that surrounds them’. Sadly, these words ring just as true today.